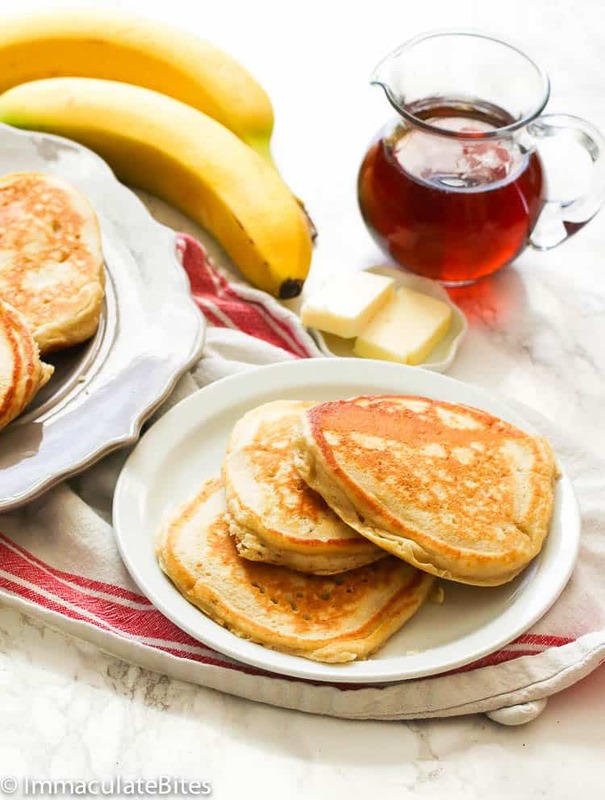 Banana Pancakes – fluffy, tender banana-infused pancakes made primarily from ripe bananas, flour, eggs, buttermilk, vanilla and nutmeg. Super easy and tasty breakfast meal. You will never ever use boxed pancake mix again! Weekends are usually hearty lazy breakfast for us. Either I prepare them the night before (like this French Toast Bake or this Moist Banana Cake here) or go for easy pancakes and waffles breakfast. But the last time I check, it has always been my son’s pancakes and waffles that would grace our weekend table more often. 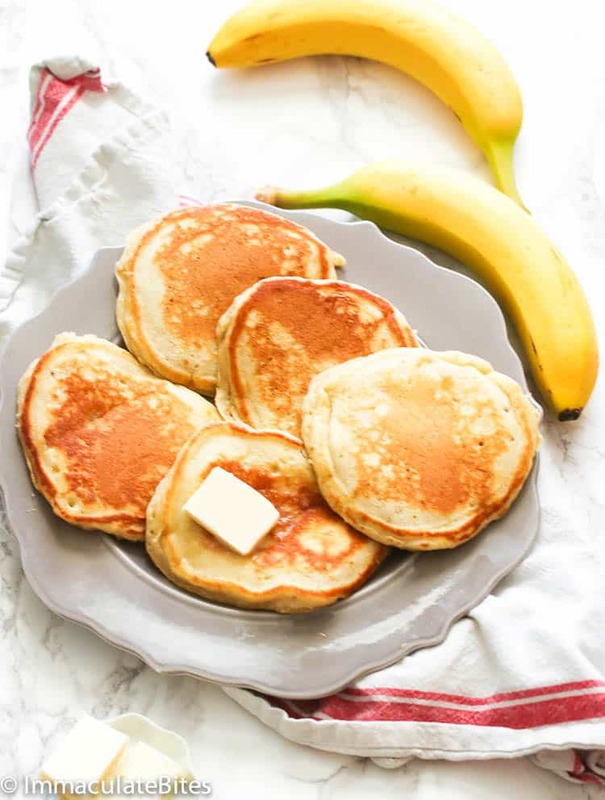 So to kinda switch things up every now and then, I’ve tried couple of pancake variety – from easy fluffy pancakes to this tasty banana pancakes. How do you make fluffy banana pancakes? This banana pancakes recipe here is one of the easiest breakfast you’ll ever have and its packed with flavors. My son go crazy on them! They’re perfect with with or without the toppings. And there’s more than that. These comfort food right here is so fluffy and light compared to ready-made boxed pancake mix. For those who are health conscious, you can easily customize these banana pancakes to suit your preference. You can swap the flour to almond or whole wheat flour. Others would even use an oatmeal flour. Of course, there’d be a slight difference with the texture and taste. 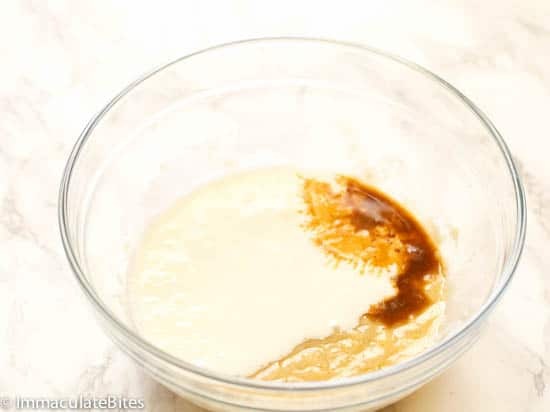 Furthermore, if you’re trying to avoid processed sugar, you can replace it with honey or better yet add another ripe banana (making it 3 bananas) to act as a natural sweetener since ripe bananas are already sweet on its own. Can you add banana to pancake mix? If you are really, really pressed with time, you can add mashed bananas to your favorite pancake mix and call it a day. But you’d be missing that beautiful rise and fluffy texture though. But hey, go with whatever rocks your boat, it would still work fine. 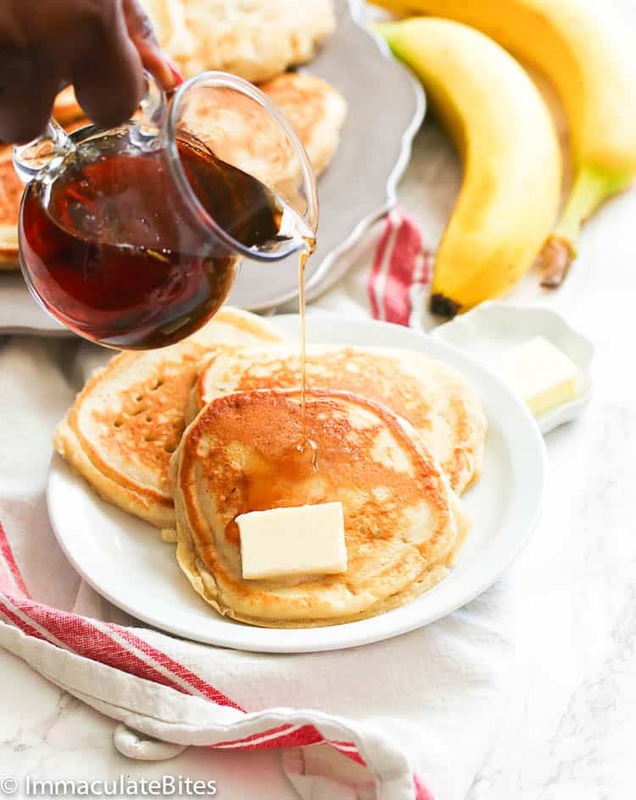 You’ll still be able to taste that banana-infused pancake breakfast in every bite, although not as delightful with this banana pancakes made from scratch. You can eat it on its own or serve it the classic way with maple and butter on top. This would be the perfect breakfast over the weekend or during holiday mornings. Add eggs without separating will yield tender pancakes , no need to separate ; unless you want fluffy pancakes. You can always pre-mix all the dry ingredients and put it in jar or large container for convenience. Then add the rest of the ingredients when you’re ready to make a batch. Flip the pancakes as gently as possible! No buttermilk? No worries. 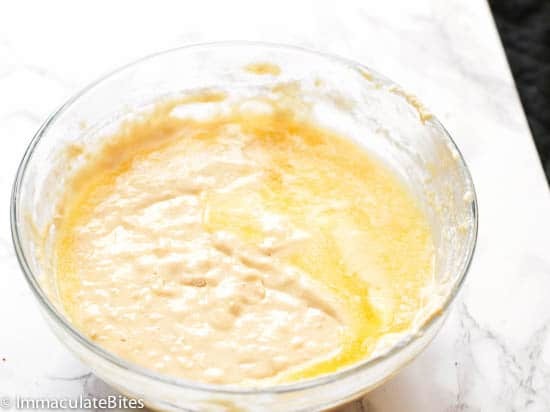 Acceptable substitute is milk and lemon juice or vinegar. 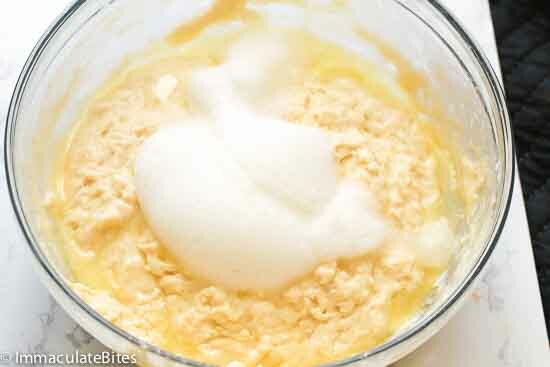 Combine 1 cup milk with 1 tablespoon lemon juice, let it sit for about 10 minutes. And you are all set. 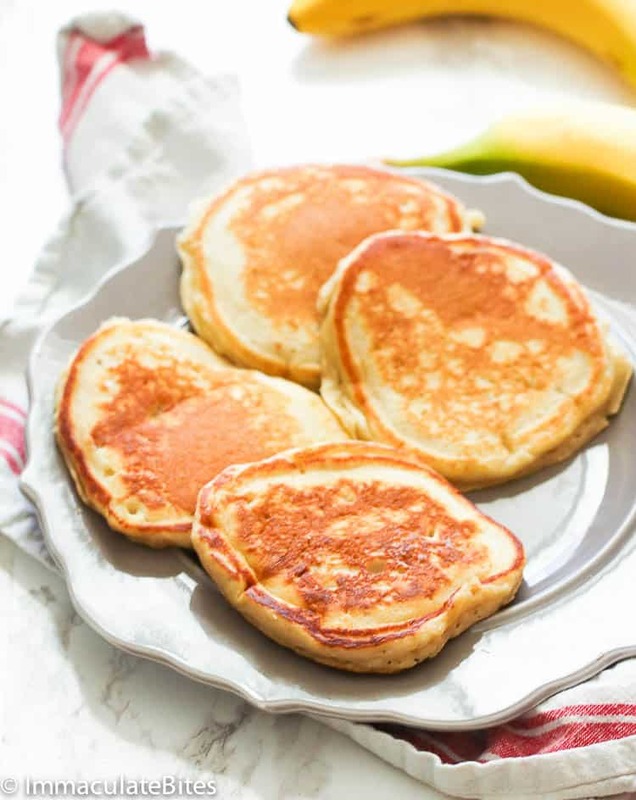 Banana Pancakes - fluffy, tender banana-infused pancakes made primarily from ripe bananas, flour, eggs, buttermilk, vanilla and nutmeg. Super easy and tasty breakfast meal. 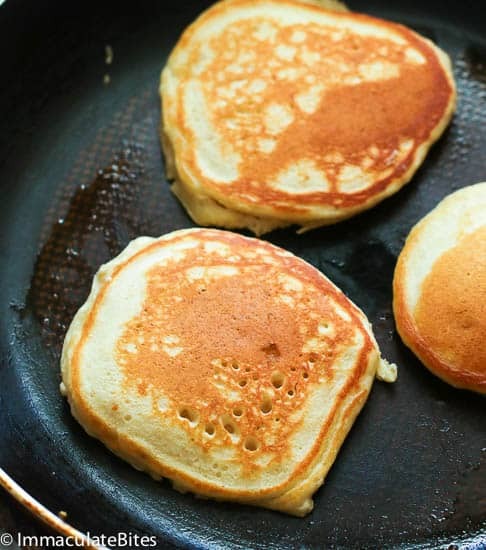 You will never ever use boxed pancake mix again! Add peel bananas into a bowl, then mash using a potato masher or the dinner fork Leave the bananas as chunky or as smooth as you prefer. You may leave the bananas as chunky as you like or puree. 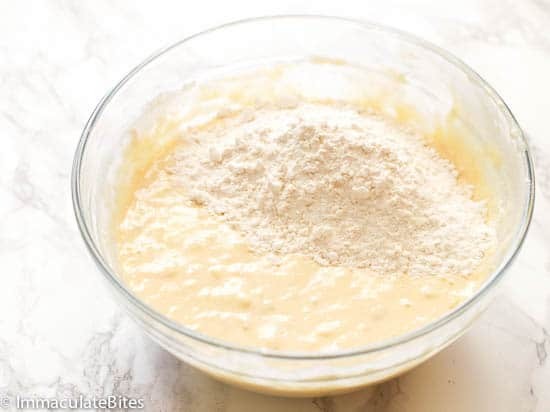 In a large bowl combine flour, salt, sugar, baking powder , baking soda and nutmeg (if using any), whisk to fully combine. Then add to flour mixture , mix as little as possible until fully combine. Slowly fold in melted butter , you will have a thick batter. Do not over mix, it makes the pancakes tough. Finally fold in eggs whites until fully combine. Set batter aside until ready to use . Heat a lightly oiled cast iron or frying pan over medium high heat. Scoop about ¼ cup each of the batter onto the cast. You will probably need to help spread the batter. Gently flatten with a back of a spatula or back of a spoon to even out the batter. 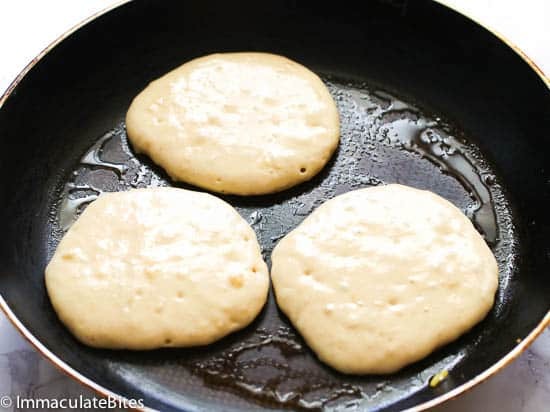 Fry until bubbles start to appear on surface and edges of pancake starts to brown about 2-3 minutes. Flip and cook the other side for another minute or two until golden brown. Repeat until pancake mixture is finished. Remove and serve immediately with syrup and/or butter. 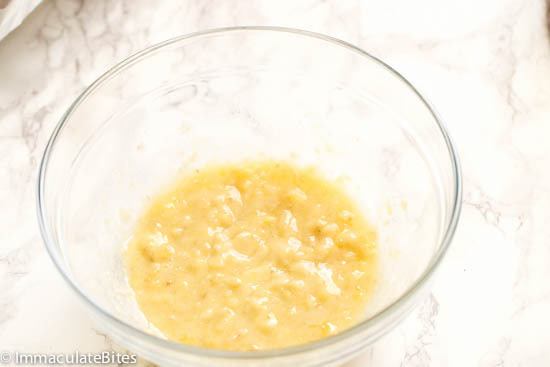 Add peeled bananas into a bowl, then mash using a potato masher or the dinner fork. Leave the bananas as chunky or as smooth as you prefer. You may leave the bananas as chunky as you like or puree. In a large bowl, combine flour, salt, sugar, baking soda, baking powder and nutmeg (if using any), whisk to fully combine. Next flour mixture, mix as little as possible until fully combine. Slowly fold in melted butter, you will have a thick batter. Do not over mix, over-mixing can make your pancakes tough. Then add whisked egg whites. Good morning. Please at what point do we put the baking powder- it is listed in the ingredients but not the instructions? Hi, Sam. Please see step #2. 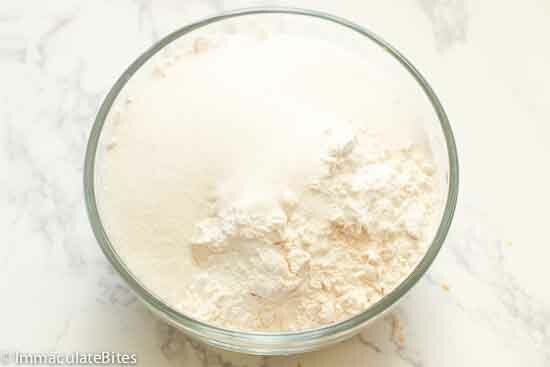 You add baking powder with the rest of the dry ingredients. That’s a great way to top these banana pancakes. Thank you for sharing! What did you mean by “mix as little as possible”? What does it mean to fold in butter? You also mentioned to not overmix. R we going to add the egg yolk and white after separately whisking back into the banana mixture? Hi Imma. 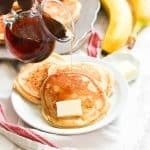 I love your recipes, and because my son LOVES bananas and pancakes I really want to try this recipe out. I have one question first. How much butter is supposed to be folded into the batter? It’s a 1/4 cup melted butter. Recipe updated. Thanks. You are a part of my cooking mentor..
Did I miss the amount of melted butter? I couldn’t seem to find a quantity.